Can Tensioned Fabric Structures for Parking Garages Solve Your Challenges? As cities thrive and urban sprawl continues to transition suburban areas into working metropolises, the need for parking solutions grows. While public transportation and ride share apps give people options for leaving their vehicles at home, the U.S. Census Bureau estimates that 128 million people (85.4% of America’s workers) drive to their workplace. Tensioned fabric structures for parking garages are quickly becoming the leading solution for architects and property owners who are looking to address a wide range of issues – from UV protection to vehicle security to business differentiation. Here’s how tensioned fabric structures for parking garages can change the game for your upcoming site upgrades. In the age of increasingly expensive vehicles, many consumers will pay significantly higher rates to protect their investment from the elements. Whether your customers are using your property for long-term or daily parking, many are hesitant to leave their cars exposed for long or ongoing periods. 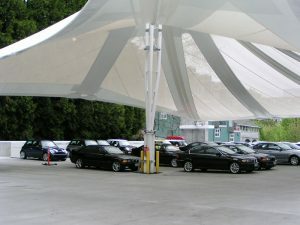 From blocking the sun to providing protection for rain and hail, tensioned fabric structures can upgrade your lot or rooftop to “covered parking” status. While there are many benefits of tensioned fabric structures that make them ideal for parking lots and rooftops, two are particularly noteworthy. Tensioned structures can span long distances at a fraction of the cost of traditional structures. Additionally, the designs often require minimal foundation beams, meaning you’ll continue to maximize your footprint for parking spaces. Not all tensioned structures have a horizontal, roof-style design. Tensile membrane facades are a vertical solution for parking garages that provide a wide range of benefits, including shade, protection from the elements, and enhanced security. By wrapping the exterior of the garage with tensile mesh membrane, your garage becomes an enclosed structure (while maintaining its open-air status). 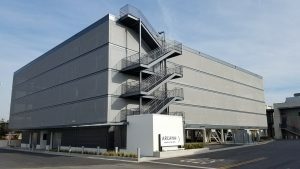 While not used as a barrier, the tensioned fabric panels deter outsiders from entering the facility in any unintended way, leaving your customers with the peace of mind that their vehicle is safer than in other lots. Additionally, tensile membrane facades add aesthetic appeal to your facility – transforming industrial-looking garages into modern structures. Use graphic printing or LED lighting to add branding or make your garage an iconic structure in the surrounding neighborhood. Tensioned fabric structures for parking garages can be designed to do more than just protect the vehicles from the elements – they can protect your customers, too! Especially in locations where inclement weather is common reality, you can make your business stand out by providing covered entryways and walkways for your customers. They’ll certainly remember the convenience and comfort when they’re looking for a place to park during rain, snow, or hot summer days. Additionally, tensioned fabric structures are ideal for the waiting areas at Park & Ride types of properties. Differentiate yourself from the competition as a business that does more for its customers by incorporating tensioned fabric structures for parking garages into your renovation or new construction. 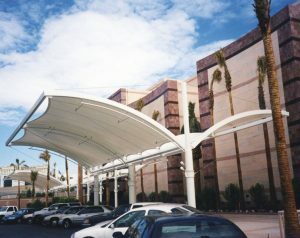 Are Tensioned Fabric Structures for Parking Garages Right for Your Next Project?